So today was the day to inspect the top box (i.e. honey super) and remove the queen excluder. I only wanted to keep the queen out of the top box for a short time - comb would be free of newly laid eggs. ~21 days ago I moved a frame of natural comb from the middle box. 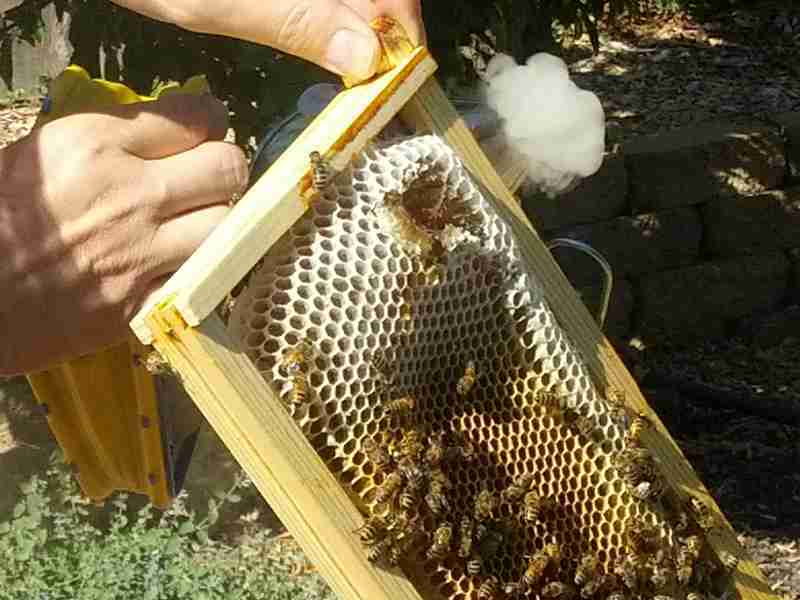 All the brood in the frame had all hatched out and the comb was repurposed for honey storage. They had drawn out the comb wider than I expected due to the fact that the adjacent frames were not all drawn out to the frame edges. The bees took advantage of this space and made the center honeycomb fatter than normal. Even wider because the box had only 9 frames - using frame spacers evenly space frames to allow bigger honeycomb. The widest corner was so fat it broke during frame removal. Since it was already damaged I choose to use this as our sample to taste. 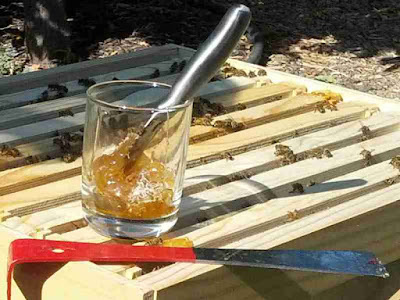 Unfortunately the honey was not completely ready (cured and capped) and It did not taste 100% ready but it was still good. I took a look at the hive to see the progress in the box I added. Yes there was some honey! - more than I have seen from them so far. I had added atop the hive a new box i.e. Honey Super with two new open frames. Also, I added one full frame of brood/nectar up from the box below to "seed it" (encourage them to congregate). I also added a queen excluder to temporarily separate her from the top box. I wanted to keep the queen out of top box for an attempt to get a clean sample of honeycomb without her laying eggs in it. It wasn't apparent to me that the full frame I moved up actually had drone cells in it. I inspected the honey super (a week later) and noticed drones milling about in the top frames. This is not really a huge problem - but because they had hatched out, they are now trapped above the queen excluder. Drones are fatter than workers, like the queen, and cannot pass through the excluder to the rest of the hive. So, they're not able to leave the hive as they want to do for breeding purposes. I will soon be removing the excluder from the hive on my next visit. There is some discussion about queen excluders on honeybeesuite.com. Inspected the bottom tray: I see two hive beetles running around - Promptly crushed! So, one morning I get up about 4:30 AM, no particular reason. 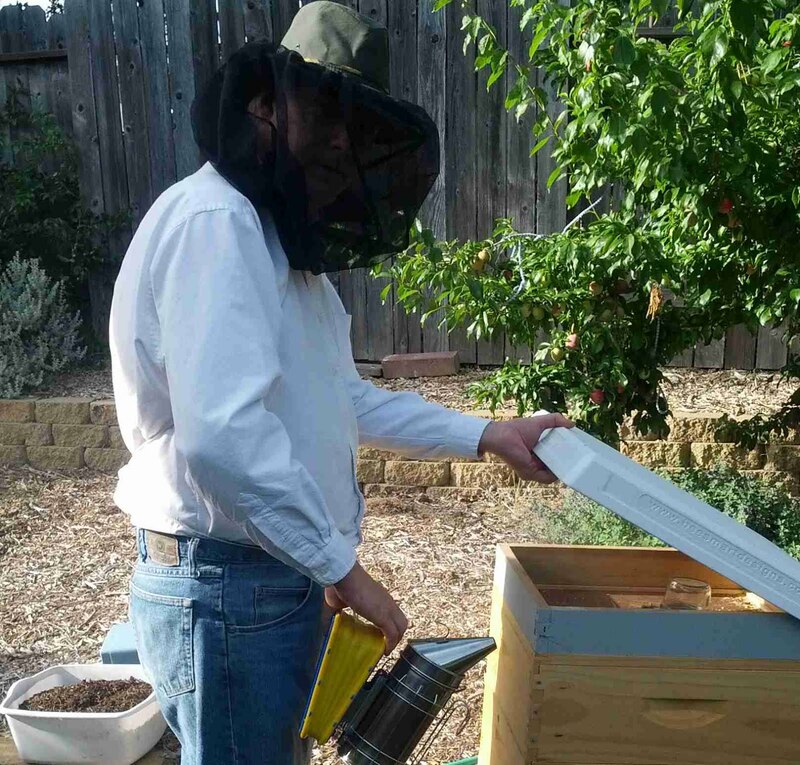 I looked out to the backyard and I see a shadowy figure moving around the front of my hive. I dash to get my pistol-grip flashlight and illuminate the area. Wouldn't you know it, a skunk, busily stomping around in front of my hive. I have learned that skunks are avid bee-eaters and can wipe out a colony within two weeks. Another mad dash, to the garage. Quickly I grabbed a mop, an empty cardboard box, and a bucket. As I come flying from the house with my weapons in full force and in vigorous pursuit - I restrain my Battle Cry as I proceed towards the Vermin. However, it hears my approach and quickly turns to scurry off to the corner of the yard disappearing. Now completely vanished into the bushes - possibly under a newly burrowed access. This does not stop me from continuing throwing items and swinging my random weapons furiously - later on the neighbor told me I heard something last night - He thought it was a prowler jumping the fence - No, just an idiot running around in his underwear with cleaning supplies. I do not have my hive up on a stand high enough to avoid this problem. The lore is that they won't stand up to eat bees - this will expose their soft belly to stinging. They'll scratch at the entrance to entice the guard bees to come out and then they will eat them. It's also good to note, that the ground directly in front of the hive may be cleaned and cleared of rubble which apparently is an area that they use to smash and eat. It was true, the area in front of the hive was all cleaned of normally chipped bark - now is bare dirt. In fact, this was not the skunks first visit. I have notice this clearing of the ground a few days earlier and now I know exactly why. I did an inspection of my hive and it did not have any claw scratches. However, lately during these hot evenings many of the bees have not gone inside. They just congregate on the front (bearding) and stay out all night and become an easy meal. An interesting remedy I read, was to smash a couple of aspirin and put it into an egg. It seems that skunks find the eggs irresistible and eat them. I guess aspirin is toxic to them - the trap has been set ,we will soon see... Or maybe not see as the case may bee. The bugger came back again. However this time I just watch him. Most of the time he is just randomly poking/digging around - he acts like he doesn't know what he's doing. When he sniffs closely at the entrance of the hive, he jumps back. He continued to stomp / scratch the ground around the front area of the hive - eating dead or dying bees - not the live ones. At one point he walked away scratching his face against the ground as if maybe one of them got him. He doesn't seem like a threat but I will keep an eye on them. I still have the trap ready and armed. Oh, yeah - he totally ignored the egg!